This article is about Bank of Korea after 1950. For Bank of Korea before 1950, see Bank of Korea (1909–1950). The Bank of Korea (BOK; Hangul: 한국은행) is the central bank of South Korea and issuer of South Korean won. It was established on June 12, 1950 in Seoul, South Korea. The Bank's primary purpose is price stability. For that, the Bank targets inflation. The 2016–18 target is consumer price inflation of 2.0%. The Bank of Korea was established on June 12, 1950 under the Bank of Korea Act. Following liberation on August 15, 1945, the Korean economy was plunged into turmoil. Tackling the severe inflation and financial disorder brought about by an acute shortage of resources and the division of the country along the 38th parallel was the immediate priority. In this situation, discussions raged across the country on establishing a central bank for the Republic of Korea and Dr. A. I. Bloomfield, dispatched from the Federal Reserve Bank of New York, drafted the Bank of Korea Act. Based on this draft, the Bank of Korea Act was passed in May 1950 and the Bank launched its operations as a central bank on June 12, 1950. It was given a wide range of functions in relation to monetary & financial policy, bank supervision, and foreign exchange policy. The primary purpose of the Bank is to pursue price stability. Under the Bank of Korea Act (Article 1), the primary purpose of the Bank of Korea is pursuing price stability so as to contribute to the sound development of the national economy. The Bank of Korea implements this target through adjustments to its reference interest rate, the Base Rate. The purchasing power of money depends on prices. When prices rise, the same amount of money buys less than before. Therefore, it is naturally the task of a central bank to safeguard the value of the money by keeping inflation low. Prices are influenced by various factors such as corporate investment, household consumption and international prices of raw materials. Meanwhile, among the various policy instruments to bring about price stability, the monetary policy of a central bank, which adjusts the quantity of money in circulation, is the most effective. For these reasons, the responsibility for price stability is given to central banks in most countries. The Bank sets and announces an inflation target for a certain period and strives to meet this target. The 2016–18 target is consumer price inflation of 2.0%. At the apex of the Bank of Korea's organization is the Monetary Policy Committee (Geumnyung Tonghwa Wiwonhoe). The Committee's prime function is the formulation of monetary and credit policies. In addition, the Committee deliberates and resolves on major matters concerning the operations of the Bank of Korea. The Monetary Policy Committee is composed of seven members representing various groups in the national economy: 1) the Governor, ex officio; 2) the Senior Deputy Governor, ex officio; 3) one member recommended by the Minister of Strategy and Finance; 4) one member recommended by the Governor; 5) one member recommended by the Chairman of the Financial Services Commission; 6) one member recommended by the Chairman of the Korea Chamber of Commerce & Industry; 7) one member recommended by the Chairman of the Korea Federation of Banks. The members are appointed by the President for four-year terms except the Senior Deputy Governor whose term is three years and are eligible for reappointment. All members serve on a full-time basis and no member may be discharged from office against his will. The Governor serves concurrently as the Chairman of the Committee. 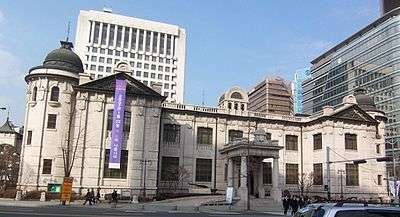 The executive of the Bank of Korea consists of the Governor, the Senior Deputy Governor, and five or fewer Deputy Governors. The Governor, appointed by the President on the deliberation of the State Council, represents the Bank. The term of office of the Governor is four years and he or she may be reappointed only once. The Governor conducts policies formulated by the Monetary Policy Committee as the chief executive officer of the Bank. He or she also keeps the Committee informed about current matters requiring its attention and provides it with materials and advice necessary for the resolution of its policies. In addition, the Governor may attend and state his or her opinion on matters related to money and credit at the State Council. The Senior Deputy Governor assists the Governor and is appointed by the President upon the recommendation of the Governor. The Deputy Governors are appointed by the Governor and undertake their respective duties in the manner stipulated in the Articles of Incorporation of the Bank of Korea. The term of office of the Senior Deputy Governor and each of the Deputy Governors is three years and they may be reappointed only once. 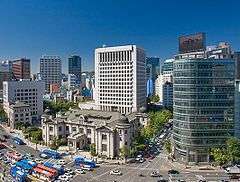 As for its executive body in detail, The Bank has 15 departments in its head office in Seoul, and 16 branches in major cities. In addition, it has five overseas representative offices in major international financial centers, such as New York, Frankfurt, Tokyo, London, Beijing. The Auditor, appointed by the President on the recommendation of the Minister of Strategy and Finance, inspects the operations of the Bank of Korea and reports the results to the Monetary Policy Committee. The Auditor prepares and submits a comprehensive audit report to the government and Monetary Policy Committee each year. The term of the Auditor is three years and he or she may be reappointed only once. The Bank of Korea has the exclusive right to issue banknotes and coins in the Republic of Korea. Their dimensions, designs and denominations are determined by the Monetary Policy Committee with Government approval. The banknotes and coins thus issued have the status of legal tender within the country for all transactions, both public and private, without limitation. and coins in four : ￦10, ￦50, ￦100 and ￦500. The most important mission of the Bank of Korea is formulating and implementing monetary and credit policy. This is a process of controlling the supply or cost of money in order that the economy may grow in a sound manner on the basis of price stability. To this end, the Bank conducts monetary and credit policy with an emphasis on price stability while taking into consideration such matters as economic growth and financial market stability. In order to achieve the ultimate goal of maintaining price stability, the Monetary Policy Committee of the Bank sets the Base Rate every month after overall consideration of price movements, economic activity and financial market conditions. Then the Bank steers the call rate to converge on the newly-set level of the Base Rate using its policy instruments. The change in the call rate affects market interest rates such as yields on CDs and Treasury bonds, and banks' deposit and loan interest rates. These changes in interest rates tend to influence consumption and investments and, as a result, inflation. The Bank's monetary policy is conducted mainly through open market operations, apart from which the Bank uses lending and deposit facilities and reserve requirements policy. The Bank of Korea makes loans to and receives deposits from banks, thus serving as the banker to the banking sector. The Bank conducts credit operations with banks by rediscounting commercial bills or by extending loans against eligible collateral with maturities of up to one year. As the lender of last resort, the Bank may extend exceptional loans to banking institutions in periods of serious emergency. As the fiscal agent of the government of the Republic of Korea, the Bank of Korea carries out various kinds of businesses for the government in accordance with the Bank of Korea Act and other relevant laws. The Bank of Korea has onus for the operation and management of the nation's payment systems. The Bank provides settlement facilities to financial intermediaries by use of their current accounts with the Bank for final settlement purposes. The Bank operated a real-time gross settlement system for large-value interbank fund transfers, named BOK-Wire, since mid-December 1994. BOK-Wire was renamed BOK-Wire+ in April 2009, when a hybrid system was added to the system with such features as a continuous bilateral and multilateral offsetting mechanism. The Bank of Korea conducts supervisory functions for financial institutions as stipulated in the Bank of Korea Act and other related financial acts. The Bank may request information from banks and from non-bank financial institutions that enter into agreements to hold current account with it, when it deems necessary for the implementation of monetary policy. The Bank may request the Financial Supervisory Service (FSS) to examine financial institutions within a determined specific range. It may also require the FSS to have staff of the Bank participate on a joint basis in the examination of financial institutions. The Bank compiles statistics which are essential to developing appropriate economic policies across all sectors including government. These include money and banking statistics, national income statistics, the producer price index, balance of payments statistics, flow of funds statistics, input-output tables, etc. The Bank carries out research on national and world-wide economic developments in order to formulate effective monetary policy and help advise the government on various economic policy options. It also publishes various periodicals, such as the Annual Report and the Monthly and Quarterly Bulletins, to provide accurate and up-to-date information on the economy to the public. The Bank of Korea does not have targets for the exchange rate and leaves it to be determined in the market. The Bank, however, does occasionally conduct smoothing operations in concert with the government in order to moderate disorderly movements prompted by herd behavior and the like. To enhance the soundness of the foreign exchange sector, the Bank strives to maintain Korea's external debts at an appropriate level through monitoring inflows and outflows of foreign exchange and inspects and oversees the foreign exchange transactions of banks. The Bank also enters into currency swap agreements with other central banks to ensure ready access to foreign currencies when markets are disorderly. The Bank holds and manages the nation's foreign reserves at an appropriate level so that they serve as a safeguard in emergencies. The Bank invests the reserves mainly in safe and liquid foreign financial assets and strives to improve their profitability insofar as this does not detract from their safety. The Bank maintains close cooperation with other central banks and exchanges information and views with other policy-makers within multilateral organizations such as the BIS and IMF. The Bank also holds international seminars and workshops to share the nation's experience in having achieved remarkable economic development and overcoming financial crises. In recent years, The Bank has taken a leading role in establishing a global financial safety net as the central bank of the G-20 Summit chair nation. ↑ The Bank of Korea Base Rate, retrieved 27 October 2012. ↑ "Former Governors". Bank of Korea. Retrieved September 21, 2014.